Amid an off-season of disaster, the Cleveland Browns appeared to give fans a crack of light in a dark tunnel they currently reside in. The new logo was to represent the new era of Cleveland coming off a season in which the Browns saw tremendous flashes of potential and a great start to the season. Of course, the great start to the season that once looked like the biggest Christmas gift under the tree ended up being just a broom as our hopes got swept under the rug along with the rest of the dust. Despite the bitter ending, the start provides hope for us Cleveland Browns fans this season. Joe Haden has become the perfect image for our franchise as he’s transformed into a team leader. He brings intensity, respect and freshness. The word “fresh” is a term that recently describes our team well as we’re finally building in the right direction as our record improved. We’re a young, fresh squad and we have potential on the roster to compete with a deteriorating division. The logo change was one that would define the Cleveland Browns organization for years to come. And then early Tuesday morning the logo was revealed… it was the same logo just a different tint of orange. Now I know many enjoy the idea of bringing the elf back, however in the contract for new Owner Jimmy Haslam, it states two things regarding the look of the Browns. One, the elf could not be brought back. Two, whatever the logo may be it can’t be on our helmet as we wanted to remain the only team without a logo on our helmet. Rumors of Paul Brown being heavily incorporated in the logo ran wild, and I liked the idea. Why not incorporate the legendary Paul Brown who brought years of glory to Cleveland. But of course the Cleveland Browns put up the curtain and the crack of light disappeared once again. Sticking to tradition, the new and fresh logo turns out to be the same old and traditional one. This decision may not have been the favorite of many fans, but after all of the years of suffering this traditional Cleveland Browns look deserves a taste of victory. It’s the Cleveland way and it represents our crazy (or as we call ourselves “passionate”) fans. 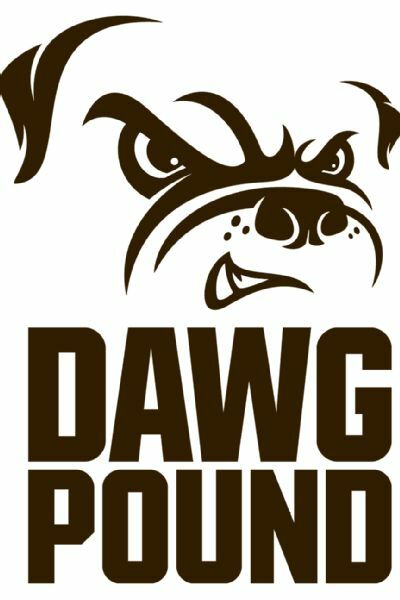 There was a little gift to the fans however, as they added a logo for the infamous Dawg Pound. Despite repeatedly having a broken heart after every season, us Browns fans still tune in every single game to watch. The fans never break the tradition of being a loyal and passionate fan, so we must remain loyal and passionate to our teams image and logo. Besides, the uniform changes won’t come until April, so that light is still there. This entry was posted in NFL and tagged browns logo, cleveland browns, dawg pound, jimmy haslam, paul brown on February 26, 2015 by Matt Stevenson. For the owner of the Washington professional football team, Dan Snyder, there is a big issue surrounding his long-standing team. The team name has drawn much fire over the past few years and more recently has seen a spike in attention. The team name as many know is the Washington Redskins. To many (if not all) in the Native American community this term ‘redskin’ is seen as a racial slur. The battle has waged on with not only prominent Native American representatives but also the U.S. government with the owner Snyder. This past year the Trademark Trial and Appeal Board cancelled the Redskins’ trademark with the reasoning being that it may be offensive to Native Americans. This ruling was a big blow to the brand that has been around the NFL for decades. Ultimately making the logo, name, etc. something to be freely marketed upon with no need to recognize the formal organization that is the NFL team. This past Monday, court papers were filed by lawyers representing the team to fight the original ruling saying that the decision to cancel the trademark violates the first amendment right of free-speech and unfairly singles the team out. The quote from the lawyers taken by the Associated Press essentially states that the court acted unfairly by picking sides. I find it interesting that this topic is kind of under the radar right now. I know that it is not football season and with ‘March Madness’ and other sports ramping up it can be lost in the mix. However, this debate and finale ruling could be huge in either direction. This battle between owner Dan Snyder and the government/Native American community is dragging out and it seems like no end is in sight. Which could be something where we don’t see a final say so or even change for many years down the road. Since I am neither a Native American or Washington Redskins fan, I don’t have a true stake in the matter. I do see the side of the Native Americans with having the name changed since it is offensive to them and there are thousands of other choices for mascots. Likewise, I do see the whole side of the team saying the term in this context is not intended to offend. I don’t think you necessarily pick a mascot to be offensive or to be something that you think is an unworthy representative of your team. Then again it probably easier for me to say since I am not in the shoes of Native Americans that are truly offended by the name. Ultimately even though I don’t have a personal stake in the matter, I do think the name change needs to be made. Mr. Snyder, make the change…now. Above I put a more serious debate on the issue of the name, but below this is a video done by The Daily Show with a serious look at the issue while still giving a bit of satire toward the stance of Snyder and the organization. This entry was posted in National Football League and tagged Dan Snyder, Redskins Name Controversy, washington redskins on February 26, 2015 by Kaleb Page. The New York Yankees have decided to retire three more jerseys. One of those jerseys being number 46, Andy Pettitte. Pettitte was a stellar athlete for the Yankees. With the team he won 5 championships and spent his whole career 16-season career in a Yankee uniform. My question for you is does Pettitte deserve to have his jersey retired? Think about it as you read. Professional sports teams have been known to cover their star players for their poor actions off the field. In 2007, Pettitte admitted to using the drug HGH in 2002 to speed up a recovery from an elbow injury. Recently, the Yankees have absolutely ripped apart superstar Alex Rodriguez for his steroid scandal. They acted like they were an organization who held their players to high standards. Now, in the middle of this Rodriguez scandal, the Yankees make a controversial choice to retire Pettitte’s number even after Pettitte admitted to using a banned substance. To me, it is an honor if you get your jersey retired. It means that you made history, paved the way for younger players, was an outstanding citizen, and did so by still following the rules of the game. Pettitte simply did not do this. Sports Center brought up a great debate, on if Pettitte is really worthy of this honor. Now granted it is not the Hall of Fame, but your jersey being retired on any team especially the legendary Yankees, your respect for the game is not there. Now I ask you, should Pettitte’s jersey be retired, and should the Yankees one day retire Alex Rodriguez jersey? Is there a different between what they both did? This entry was posted in MLB and tagged andy pettitte, hgh, MLB, New York Yankees on February 26, 2015 by kiatyus. The Daytona 500 is regarded as one of the greatest annual sport spectacles, and is even referred to as “The Great American Race”. It is a 500 mile race consisting of 200 laps around the Daytona Speedway track. Since 1959 (when the Daytona Speedway first opened) the Daytona 500 has always been the first race of the NASCAR season, and although it is the first race of the season, it holds implications as though it is one of the ending races of the Sprint Cup Series. On top of that, it also holds the largest purse out of all the races. The race took place on Sunday, February 22. This year’s race was not just about trying to become one of the largest live global television events (the 2006 Daytona 500 is ranked 6th with 20 million viewers), or about the purse of about $20 million, but all the storylines that were a part of the race this year. The first begin with the infamous Jeff Gordon, racing for what was, his final time in the Daytona 500. One of the most decorated NASCAR drivers, decided in mid January to announce that this will be his final NASCAR season. Gordon, who is 43, will be racing in his final season, so you can expect for him to give it all in every race this season, including the Daytona 500, where 16 years ago he won this race. He has won 92 NASCAR Sprint Cup Series races and the Daytona 500 marked the beginning of the end for him. Unfortunately for him after looking like he was in complete control of the race having led 87 laps in the Daytona 500, after getting kicked back in the pact after a restart and being part of a multi-car crash in the last lap of the race, he ended up finishing 33rd. The good thing is, he was all smiles having finished his last Daytona 500. Since first racing in the NASCAR Sprint Cup Series in the year 2000, Kurt Busch has always known to have some anger issues. Well he may have really outdone himself this time. On February 20th, 2 days before the big race, he was suspended indefinitely by NASCAR because of an act of domestic violence toward his girlfriend, whom had a fight and he took her head and slammed it against the side of his motor home. In his place, an underdog, a man named Regan Smith, who in his 8 years of racing in the Sprint Cup Series, has only won 1 of his 172 races. He ended up finishing 16th in the Daytona 500 and was hopeful that he will have much better race weekends. After a horrific crash into an unprotected barrier Kyle Busch was also not partaking in the race this year. On Saturday, in the Xfinity Series race, Kyle went into the barrier, breaking his leg. Leaving out the Busch brothers who have always brought such excitement to The Great American Race throughout the years. Matt Crafton was Kyle Busch’s substitute in the Daytona 500 and had a top-20 finish (finished 18th). Dale Earnhardt Jr. won the Daytona 500 last year, and that was only the start for the season to him, as Earnhardt Jr. had won of his greatest seasons of his career last year. Analysis looking at this race, believe he could be, only the fourth person in history to win the Daytona 500 two years in a row. However, he was not the going to make history on February 22nd and with a good push finished 3rd in the race, a finish that he, himself, was very disappointed in. Taking home the checkered flag was Joey Logano, whom got off to a great start after the last restart. Judging from the Daytona 500, look for an interesting season in NASCAR this year. This entry was posted in Racing and tagged cars, Daytona 500, nascar, NASCAR Sprint Cup season, race cars, racing, stock cars on February 24, 2015 by bbusutt. NBA All-Star Weekend has gained possibly the largest following of any sports regarding all-star games. The various competitions and games played by numerous players from across the league makes for a fun, high energy weekend. Of course, the event most pay attention to is the Dunk Contest. However in recent years the Dunk Contest has lost its vibe. The overuse of props and recycled dunks has many fans bored with the competition as it doesn’t even feature the best dunkers or big names in the contest as it once did. The Dr. J free throw line dunk, Michael Jordan’s classic “Air Jordan”, and of course Vinsanity have all been created on the Saturday Night phenomenon. Yet as we see highlights from the Dunk Contest now, you don’t remember seeing recent years dunks as much as over a decade and further. The ratings have been down and the media ridicules the competition for the lack of enthusiasm. This year though, a rookie from the Minnesota Timberwolves would have something to say about the lackluster contest. Andrew Wiggins held up the MVP trophy at the Rising Stars Challenge on Friday night, but his teammate Zach LaVine would steal the weekend with his almost heroic performance the following evening. Like a town in need of saving, the Dunk Contest needed a superhero-like figure and Zach LaVine delivered. Being a 90’s kid we all know of the classic movie featuring Michael Jordan, “Space Jam”. He was the hero Toontown needed to proceed happily. Well Zach LaVine whipped out the Toontown jersey with the theme song playing in the background and put on a dunk performance for the ages. Flashy, original, and perfection are three words to describe what LaVine did at the contest. A self lob off of the court, LaVine rose up with the ball and put it between the legs and reversed it home for his first dunk. The second dunk he bounced off the court again, rising up with it and smoothly putting it behind his lower back and powering it in the hoop with a forceful jam. The crowd roared with energy, all-stars stared in amazement, the announcers were screaming with excitement, and challenger Victor Oladipo along with Dr. J had a face that said it all. Receiving the highest ratings in the events 26-year history, Zach LaVine had revitalized the once spectacular NBA Dunk Contest and made it spectacular once again. This entry was posted in NBA and tagged andrew wiggins, dunk contest, NBA, zach lavine on February 20, 2015 by Matt Stevenson.